TRAILS start under a large sign on the right as you enter the car park , they are well marked but better to bring a map. There are three trail types at present. 1. Red , a 30km loop starting with a serious initial climb , nothing too technical , but riders should be able to manage small drops and rock gardens. 2. Black, a 17 Km loop taking in some red but with sections requiring significant skill and experience , bigger drops and bigger rocks. 3. Orange, two trails , one an out and out downhill requiring the right equiptment and a lot of skill. The other (Mega Mission) is smoother but with large table tops berms and again requiring significant skills. But don’t just come to Rostrevor and “Do” the trails , it has much much more to offer with lots of open mountain riding . Check out our sister website Not The Sunday Run for details. Join us on a Saturday morning or contact us for guiding services. 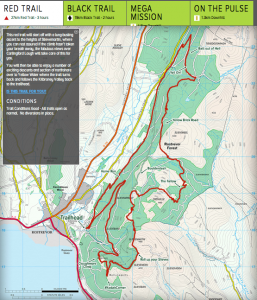 For beginners at the moment there are lots of forest tracks , including the Ulster Way to Batts wall where you can build your fitness and develop your off road skills . Some of the lower trails near the trail head could be tackled by anyone with half reasonable bike control skills, there are a few small drops and plenty of loose gravel so watch your speed at the start. 2. Make sure your brakes work and your bike is in good order . 3. Preferably don’t cycle alone but if you do bring a mobile phone . Parts of the trail are far away from any help and if you fall and injure yourself , you cannot rely on someone else turning up to help you.